It was a windy day at Davis Diamond for the second game of Texas A&M softball’s weekend series against Florida. 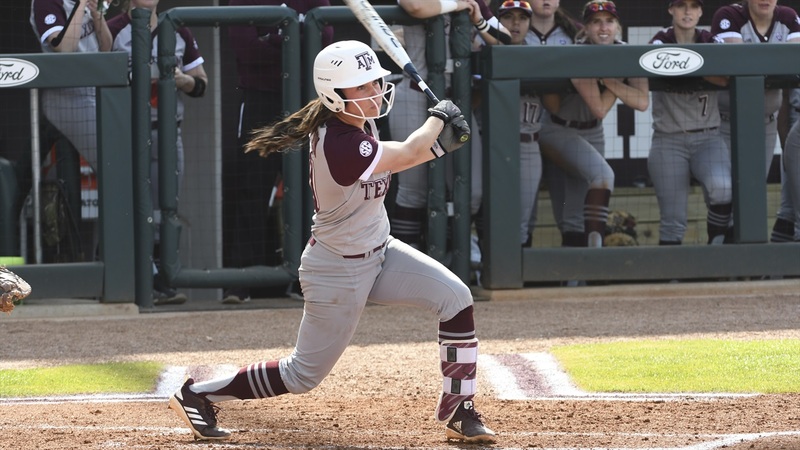 The Aggies were looking to avenge their loss to the Gators from one day prior, but they would end up unsuccessful, suffering an 8-3 loss. It was a slow start offensively for both teams in this one. Florida was the first to get on the board after junior Kendyl Lindaman’s RBI double in the top of the fourth. This was followed by junior Sophia Reynoso’s RBI single shortly after to give Florida a 2-0 lead after the top half of the fourth. However, Texas A&M would answer immediately. With two outs and runners on second and third base, senior Riley Sartain stepped up to the plate and delivered a two RBI single, her only hit of the night. “We really worked on attacking the pitches we know they [were] going to throw,” Sartain said after the game. She got the pitch she was looking for and was able to capitalize. It wouldn’t take Florida long to retake the lead. With two outs in the top of the fifth and two runners on, Lindaman hit an absolute bomb for a three-run home run. Florida’s hitters began to heat up in the sixth inning. The Gators tacked on some additional insurance runs off a leadoff home run courtesy of sophomore Jordan Matthews. They would go on to score two more runs in the top of the sixth to give them a six-run cushion. Aside from scoring one more run in the sixth, Texas A&M couldn’t find any offensive production after their two-run fourth inning. They stranded runners on multiple occasions and simply couldn’t keep up with Florida’s offensive production. The Aggies made some brilliant plays defensively early, but the Gators countered that with timely hitting late in the game. UF’s ability to get hot offensively at the right time was the difference in this game. Texas A&M will have one more chance at to get a win over Florida tomorrow at Davis Diamond. The game is scheduled for 12 p.m. and will be streamed live on SEC Network+.